What is EQ? It’s your emotional intelligence. Yes, intellect isn’t limited to math and science. There’s a smart that has a more intuitive side, one that helps you work more effectively with others. It’s one of the pillars that supports great leadership. So, what makes a great emotionally intelligent project leader? Today, it is essential that project and program managers become more proficient at EQ competencies and behaviors. 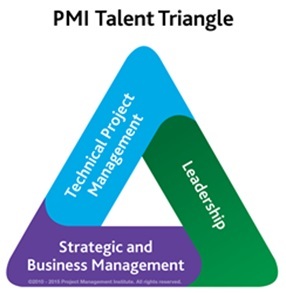 They are a key tenet of the PMI Talent Triangle (we’ll discuss this in greater depth later in the post). Every day you should focus on your leadership, partner with your customers to find solutions to their business problems and strive to elevate the discipline of project management to add value. What’s the latest research and why is it important for PMs to focus on EQ? We’ll get into that, and the reasons to develop EQ as a foundation competency. Elevating your EQ leads to a more success project leader. Recognizing and understanding other people’s emotions. Over time, the project management community began to embrace EQ as an important part of leading projects. J. Rodney Turner, professor of project management SKEMA Business School in France and Ralf Müller, professor of project management at BI Norwegian Business School, have conducted academic studies noting the importance of EQ for project managers. “Project Managers interested in growing their PM and leadership abilities should invest in EQ,” write Nicholas Clarke and Ranse Howell in their book Emotional Intelligence and Projects. Know that everyone has some level of emotional intelligence. Take tests or assessments to help validate your strengths, identify areas for improvement and get feedback from your network. Assume your intelligence and education are enough and think you don’t need training, a mentor or coach. Ignore feedback, blind spots or your emotions; even if you can manage teams and complete your projects on time within budget. The psychological study of self-awareness can be first traced back to 1972 when Psychologists Shelley Duval and Robert Wicklund’s developed the theory of self-awareness. They consider self-awareness as a major mechanism of self-control. Psychologist Daniel Goleman, has proposed a more popular definition of self-awareness in his book on EQ. He says that being self-aware is, “knowing one’s internal states, preference, resources and intuitions”. Goleman places more emphasis on the ability to monitor our inner world, our thoughts and emotions as they arise. It is important to recognize that self-awareness is not only about what we notice about ourselves but also how we notice and monitor our inner world. Over the years, people have started to refer to project managers as leaders. Why? It creates a shift in mindset from a title to an action. Leadership is a PM competency. It’s a paradigm that Mersino identifies in his book, Emotional Intelligence for Project Managers: The People Skills You Need to Achieve Outstanding Results. According to Mersino, the key to project management is through self-management. You must first start with focusing on your emotional self-awareness as well as the components of self-management. The great news is that no matter what amount of emotional intelligence you have today, you can improve, and improvement over time can only help your career. Merino’s research addresses team leadership as the essence of what sets us apart in adding value to organizations. We focus on the three key ways emotional intelligence can help make projects successful: communication, conflict management and inspirational leadership. Mersino listed seven key benefits of learning and applying emotional intelligence in his book. Many of these benefits span one or more roles in the career and life pathway for project management practitioners (Project/ Program, Agile, Virtual leader). Some of these may seem relatable and others may not since you may have not thought of the benefits of EQ in this way. Certainly, we can see how these benefits apply and we continue our discussion on recent research. PMI Talent Triangle was launched several years ago and it encompasses the skillset domains and areas to earn Professional Development Units (PDUs) towards all certifications. As project/program managers where do you look for training to improve your skillsets and accelerate your capabilities? Training courses, books, mentoring, coaching or leadership programs can provide information on how to be a better leader. We all start with some level of EQ, so consider what you need to ramp up your skillsets as you take on different roles and more complex projects. Based on research and data in recent PMI studies, it’s clear that you should consider the learning necessary to be prepared to lead your team and your projects as it applies to EQ. Project Management is both an art and science. EQ is not just a soft skill; if you master emotional intelligence you can leverage it to set yourself apart from your competition as a project leader. A project managers success will be based more on EQ than IQ or college education, says our contributor Naomi Caietti. PMs need to be more self-aware. She’s right, of course, and with that self-awareness and emotional grounding the path to project goals is made clear. Now that you’ve got your interpersonal skills taken care of, find a software tool that applies that leadership to the practical matters of project management. ProjectManager.com is cloud-based, giving you the data you need when you need it, and connecting you to your team, for better leadership and collaboration. See for yourself by taking this free 30-day trial.